I’m pleased to report that my “bad” children are attempting reform. Griffin has stopped speaking in one word sentences for the most part. He’s moved on to playing with light switches and messing up the electrical in my parents’ house. We are going to probably need to pay for an electrician to come and set it to rights. 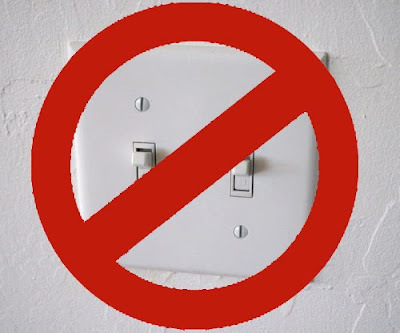 Our living room lights won’t turn off unless another, unrelated light switch is turned off. He’s getting the idea after quite a bit of discipline (he's grounded from light-switches) and for some reason, it hasn’t made me nuts like most of the other things he does, despite the potential fire hazard. I almost feel bad about that, like I should be more upset, but I guess it’s like Bill Cosby says, parents just want peace. And flipping light switches is blessedly quiet. Aubrey has been sick and has been charmingly hoarse and without much energy, but not sick enough to be constantly cranky. Xander has grudgingly conceded that I may be, at times, more intelligent than he is. Maxton never was too bad, and so he’s continued being adorable and sweet. Get this, on Saturday morning, David got them all cleaning and the floor of our house is all clear from obstructions, as long as you don’t count the bedrooms. I’m not, since having it this clean is a clear victory. They didn’t even whine about it too much. They’ve been saying cute and funny things. For instance, Maxton was taking a bath this morning and was saying he didn’t have any way to get wet, meaning he needed a cup or water vessel of some sort in which to transfer the water from the tub to his various anatomical parts. Griffin, thinking he had obviously found a good solution, kindly suggested he use the water in the tub. I think I laughed for about five minutes about that one. Aubrey and I stayed home from church on Sunday, because she has a raspy cough and a drippy nose. She was in bed when everyone left, but then got up (that girl really refuses to nap unless under extreme duress: she fell asleep in the car on Saturday after a good house hunting session and slept all through lunch in a booth at Zupas, but she was not happy about it when she woke up). She came in my bedroom with a melting bead creation of Maxton’s and said, “This is for Xander. . .but, my kids are gone,” and she said it so sweetly and with a little bit of a forlorn tone. Sometimes I worry about her having so many older brothers, but she seems to thrive on it for the most part. All in all, I’m much more like my regular, happy-to-be-a-mom, aren’t-my-kids-so-cute? self than I was last week.